Borderlands 3 has got a lot of people excited, clearly. 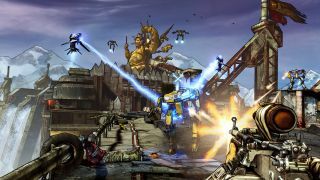 Borderlands 2 has seen a huge increase in concurrent players on Steam in the last week, no doubt a result of escalating interest in the series following the reveal of Borderlands 3. The game peaked just shy of 60K players last weekend—59,033 according to Steam Charts and highlighted here on GitHyp. The review scores remain Very Positive on both Borderlands 2 and the original game, though closer inspection will show that both games have seen recent 'off-topic review activity'—read more about those review bombing efforts here. Borderlands 2 has remained a firm favourite with PC players since its release back in 2012. It's been discounted a lot lately, too, which has likely driven further interest in it. Or maybe it's that 4K texture pack that was added to the game? If you're wondering what all the fuss is about, you can check out why Jody thought Borderlands 2 was ahead of its time. Alternatively, you can read up on everything we know about Borderlands 3, which is set for release on September 13.